We have some VERY exciting news! The Surfing Federation of India has invited four of our kids to participate in an International Surfing Competition in August. We have picked two girls and two boys to represent Bangladesh and are honored to be a part of it! Last year the president of the federation visited Cox's Bazar and spent time with our kids and was impressed by their dedication and extended an invite, but it was too short of time to prepare the kids and get permission and passports ready. This year we really hope to go, and hope to raise the money for their passport fees, visas, and flights. Once we get there, the Surfing Federation of India will cover our boarding and food:) All of you have been so amazing and generous in taking care of our kids- it surely takes a village! If you want to be a part of sending them on this once in a lifetime experience you can donate here or at our sister-site Pelican Crew's website, all donations are tax-deductible and we will send you a receipt with our tax-id number. If we have any money left over, it will go towards food donation bags to the kids to keep the program running for the rest of the year:) Please help us make this dream possible! We made this little video for the kids to see how much they have grown and see the change over the past few years. Not all the change has been good, kids have come and sadly gone. But we are grateful for the fun we have had and for all the people that have met along the way and that have partnered with us to make this dream possible. We can’t thank you enough for the love and support. I (Venessa) just returned from Bangladesh a few days ago, after being gone for over a year. Rashed will be staying there for an additional month to check in with the leaders, the kids, and their families and prepare the kids for the upcoming surf contest. It was definitely an amazing trip- the kids have grown so much, almost every single one of them is enrolled in school, receiving tutoring, riding shortboards, improved in their skateboarding skills, bringing and sharing what they have learned with their younger siblings. Also to see the kids acting like a typical adolescent teenager with an attitude- makes me respect my parents so much more, I don’t know how parents do it. Rashed, Roshiid, and Sukkur have been so patient and incredible leaders- even when the kids make it very hard! My heart couldn’t help but break to see and experience what the club was like without two of our original girls- one is now working in a garment factory in Chittagong, and the other has chosen to stay home and learn the ways of cooking and preparing to be a wife soon. As much as it was their choice, I wish that there would have been a way to convince them to stay, to be able to give them their dream. It was the first time I let myself deal with the heartbreak of all the time and investment in their lives and to have them walk away because they were tired of the fight and having to stand up for themselves. We could only do so much, and at the end of the day we want to help people who also want to help themselves. 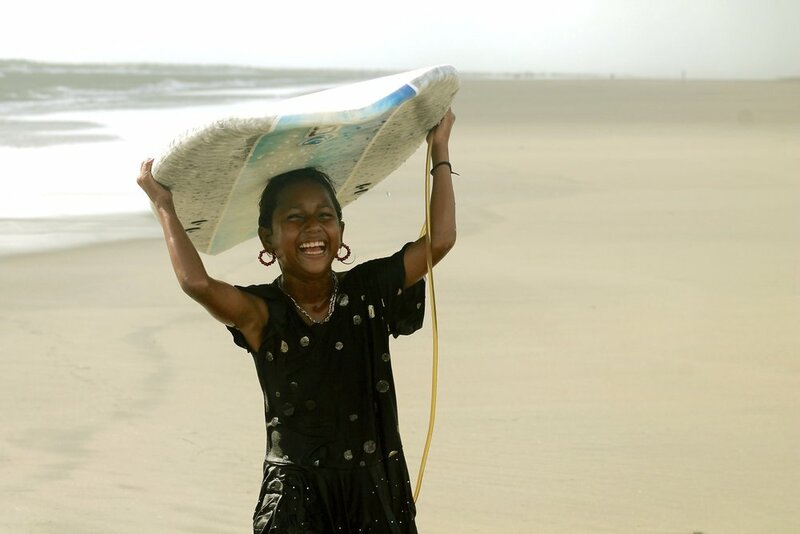 We are grateful and holding close the kids who are continuing to be changemaker’s in their community in hopes that one day they will have the chance to be the first in their family to go to college, get a job, maybe represent Bangladesh and surf in the Olympics (one can dream). When Allison created the original gofundme page in 2015, I would have never thought we would now be a registered non-profit, have our own website, and that we would still be able to provide food bags, education and surfing. We are ever so grateful to you for partnering with us and being a part of making these children’s journey a better one. Aisha, Nargis, and Nurullson standing in front of their school. Several months ago we were contacted by the wonderful team at O'Neill and discussed how to make a culturally appropriate outfit for the girls to surf in. This was the finished product and we are so excited! Each one was sized individually for each girl:) We are so thankful for how intentional O'Neill was at helping us! Shipping is always a problem in Bangladesh, so O'Neill contacted our good friend Joeri in Holland and sent them to him and he then packed everything in his suitcase to carry over! We will post more pics of the girls surfing in their new gear! Check out the mot recent trailer from the upcoming documentary The Most Fearless by Heather Kessinger. It features the beginning stages of when our surf girls first started surfing! The Most Fearless team has been family to us and have continued to support us!